Book 2. Arranged by Allan Small. Alfred's Basic Piano Library. Alfred's Basic Piano Library. Children; Masterwork Arrangement. Book. 32 pages. Alfred Music #00-3122. Published by Alfred Music (AP.3122). 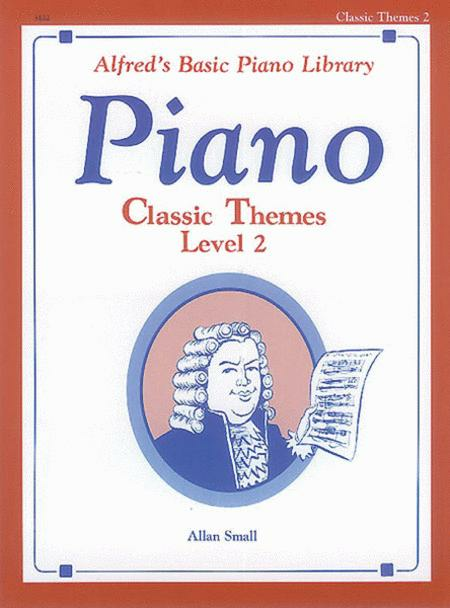 These volumes contain easy-to-play arrangements of great classical melodies. The arrangements allow the music to be introduced to younger students. While designed to correlate with Alfred's Basic Piano Library, Classic Themes may be used with any piano method or instruction course. Titles: Big Ben Rings Again * Carnival of Venice * Theme from Capriccio Italien * Come, Thou Almighty King * Drink to Me Only with Thine Eyes * El Relicario * Liebestraum * Morning Mood (from "Peer Gynt") * Over the Waves * Theme from Piano Concerto No. 2 (Rachmaninoff) * Ring Out the Old * Rondalla Aragonesa * Santa Lucia * Theme from Sonata in A Major (Mozart) * Theme from Symphony No. 5 (Tchaikovsky) * Theme from Symphony No. 6 (Tchaikovsky) * Young Prince and Princess (Rimsky-Korsakov). have as a tool. I would love to see more of this music inside the lesson books and recital books as well. 23 of 47 people found this review helpful.